The Nashua Senior Activity Center holds a variety of fundraisers and development events each year, sponsored by generous donors from the Nashua, NH area. The Center solicited these sponsors throughout the year, making it difficult for sponsors to anticipate costs and budget their annual giving. 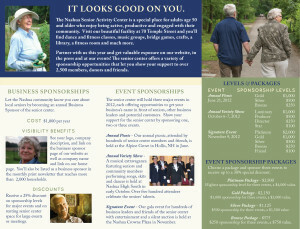 The sponsorship package specified the benefits of sponsorship, giving levels and significant package discounts for multiple events. Benefits included opportunities for promotional visibility, tickets to the event and special, sponsor-only discounts. The Center did a major mailing to area businesses that included a tri-fold sponsorship brochure, a sponsorship benefits piece and an order form that specified the package discounts. This program allowed area businesses to plan for and budget their yearly contributions and gain valuable discounts to multiple events for added visibility. 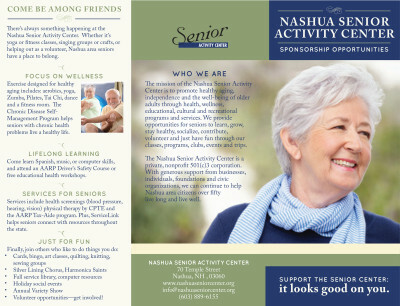 The Nashua Senior Activity Center significantly increased its sponsorship revenue and pulled that revenue into the first half of the year, typically a slow time for their fund development.